After much consideration I have decided to hand over the running of the South African section of the Baby Pack Project to a lovely Irish lady who has recently moved to South Africa. Her name is Val Bailey and she will be handling all aspects of the Baby Pack Project at this end from now on. This hasn't been an easy decision to make as I have SO enjoyed my involvement with Baby Pack Project. It is a cause that is really close to my heart and on a personal level, has given me much joy in the last couple of years. However, in the last couple of months it has become clear to me that I have to reduce my workload. I would definitely rather hand over BPP to someone else and have it done properly, than do it half-heartedly myself. So I set about finding someone to run it and the Margate Child Welfare suggested that I contact Val. I had a meeting with Val earlier in the week and came away feeling convinced that she is going to be a great asset to the Baby Pack Project. She has done volunteer work for various charities so she is very in touch with the needs of people in the informal settlements etc. She is a most energetic, youthful, grandmother and is very enthusiastic about the project - so I am leaving you in good hands! Val is unfortunately not on e-mail just yet - she is waiting for her broadband to be connected but I will pass on her email address as soon as she is "up and running". In the meantime, her "snail mail" address is: Val Bailey, Box 654, Shelly Beach, 4265, South Africa. Any parcels can be posted directly to her from now on.I do have some parcels waiting for me at the post office and a couple of unopened ones in my office - I will pass those on to Val in the next week or two. I will email those of you who sent those parcels, to let you know that they have arrived really soon! Any parcels that are currently "in transit" to me, I will deliver to Val as and when they arrive. Thank you all SO much for your ongoing support of the project and for all the lovely emails and letters I have received in the last couple of years. I hope that you will continue to support this very worthy cause. Gill Richardson. I have received loads of parcels in the last 2 weeks - it's lovely to think that a whole bunch of little babies will have something nice to wear just in time for Christmas! Thank you all for your on-going support. It has been an exciting week for the Baby Pack Project. On Tuesday Bill and Lynda Charlton from Canada paid us a visit! They brought 2 huge parcels of diapers from Nicola Blakey, as well as a large parcel of knitted booties and hats from Marie and knitted bears from Ann. They also brought some clothing for older children, which will be given to child welfare for their Safe House. We are so grateful for all of these donations. It was wonderful to meet Bill and Lynda , who are on a voyage around the world on their yacht. We were touched by their generosity and willingness to hire a car and drive all the way from Durban down to the South Coast, to deliver the donations. While Bill and Lynda were here, we went on a visit to Murchison Hospital where we handed “mini-packs” to the mothers in the maternity ward. We were fortunate enough to see many sweet little babies, including some premature babies being “kangarooed” by their mothers. We also delivered 10 complete baby packs to the hospital – these will be given to the social worker, who will pass them on to those moms who are most needy. Murchison Hospital is really a wonderful facility in an area of great need. The management and staff seem to be doing a great job. Those months that I have sufficient packs available, I will continue to supply to Murchison Hospital. We then visited Rehoboth and were taken on a guided tour of the facilities there. Alfons (the manager) answered many of the questions we had concerning the AIDS epidemic in the area and I think we all learnt a great deal about the terrible situation some of the people in the surrounding areas are living in. 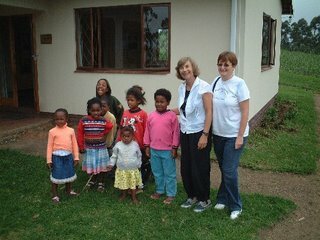 The children at Rehoboth are living in very pleasant conditions and are thriving in the loving care that they receive. Bill and Lynda donated a large parcel of clothing to the children of Rehoboth as well as some children’s books. We also gave them some of the diapers that Bill and Lynda brought from Nicola. The Baby Pack Project has been up and running for about a year now. I thought it might be nice to start a blog to chart our progress. 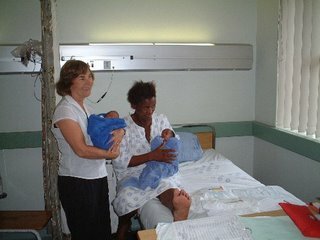 The Baby Pack Project is run by myself (Gill), here in South Africa and my good friend Alison, in Northern Ireland. I (with much help from the rest of my family) am mainly concerned with the collecting, packing and delivering of donations. Alison collects and posts to me all the donations from her area and she also drums up support for the project in all four corners of the earth! 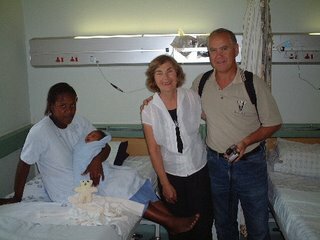 Unfortunately I have not kept a detailed list of all the parcels I have received from the wonderful ladies who donate to us - I really wish I had, but I CAN tell you that to date we have delivered 137 baby packs as well as 6 large bags of clothing for the older children at Rehoboth orphanage and the Child Welfare. We are at present supplying 20 packs per month on average to the Margate Child Welfare - who distribute the packs to those moms who most need them, mainly in the rural areas inland of Margate; we also deliver a bag of baby clothes (enough for approximately 10 packs) each month to the outreach committee of the Margate Anglican Church, who deliver them to the Ntabeni clinic. Yesterday we had a request for help from the Margate Child Welfare (MCW) for a destitute mother of triplets (2 boys and a girl). 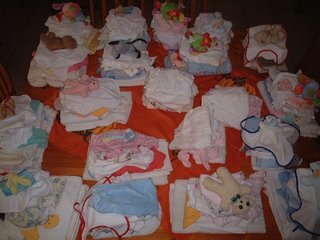 The mom has already received our usual baby packs for the little ones - but will be needing larger clothes soon. So we are looking for baby clothes in the 6 to 12 month age groups for these babies. Any donations would be gratefully received please send to: Val Bailey, Box 654, Shelly Beach, 4265, S.Africa.